An amazing quote needed a matching photo….and this one spoke to me. This mare had just given birth to her first foal the night before but it was a rough delivery. In this photo my son is holding her while we wait for the vet to arrive. Both mare and foal ended up spending a few days (and much prayer) at the equine hospital. That was three years ago now and all are well…and we are thankful. Here is a photo of that cute little foal now. I have a beautiful colt, “Critter the Colt”. 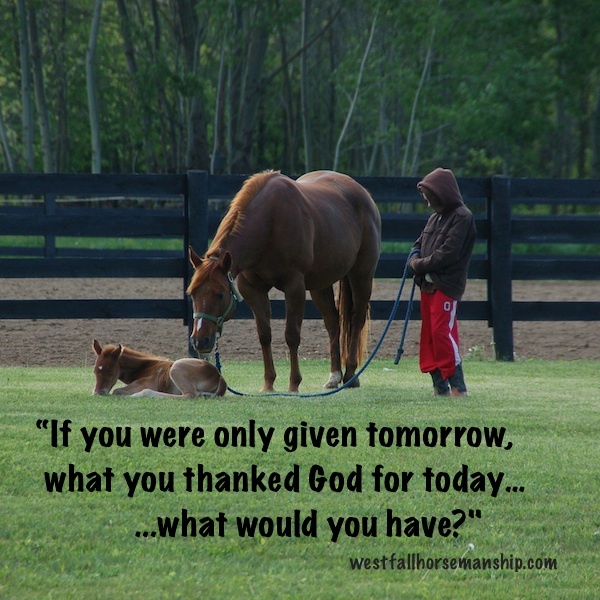 I am thankful the Lord provides for my horses. This is what I have today, my beautiful horses and my beautiful colt, Critter. Dear Paula A. I was so saddened to read about your dry-mouth condition, that must be so painful. There must be something the doctors can do, I will add your name to my church’s prayer list, when all else fails, God NEVER fails! Amen! Pat W.
Stacy, is that Popcorn who was the foal? First I am thankful for Salvation, my family, my job and good health and also I am thankful for you and how you are spreading the Word of God through your life…deep down I knew you were saved as I watched you ride and speak on your videos , it was all God’s timing that night you said “Thank you” and it opened up a whole new world! I only hope someday I can meet you! Your Biggest Fan, Pat..
Don’t forget to start writing that book about your life so it can be a movie! CAN’T WAIT TO SEE THAT!!! The foal in the photo is Lucy, my husbands now 3 year old mare. Popcorn came from the Road to the Horse competition so I didn’t meet him until he was three. I have the book about a third of the way done…at least that is my guess, but as I haven’t written one before I can’t be sure. I am hoping to have more time to write after the holidays! Thanks for encouraging me! I would have my daughter and the friends I love and the students I have taught and our two cats and the old house I inherited and, always, God’s presence. Stacy, I first learned of you when someone told me of your tribute to your father, riding you horse with no bridle or saddle. I cried tears for you and was mesmerized by your ability and relationship you had with your horse. I got my first horse later in life, so I was very green and so was my horse. We fumbled together and she became a great trail horse. I became sick with cancer and I did not know what was going to happen to me, so I sold my Misty. It has been five years and I am cancer free, but I suffer from dry mouth from the radiation. I have a new horse now. His name is Killian. 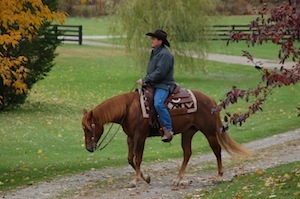 He is a Tennessee Walker and Kentucky Mountain horse cross. At ten years old, he is such a great and willing horse. He has just learned to neck rein. He is so much fun to ride because of his smooth gate. It is hard for me due this dry mouth to ride for very long, but I do what I have to do to be able to ride this amazing horse. My Misty has been abandoned by the person who bought her. She may go up for auction. It breaks my heart, but I have no means of keeping her. This is a time when I wish I had a farm. I love your videos of training Jac. I just want you to know what an inspiration you are. GOD is our Lord and Savior and without him we have nothing, no hope, nothing. GOD is amazing! There is a book that I read probably 50years ago and it title is Power in Prayer, it covers a number of issues. It’s true, Power in Prayer it can turn your life around and you see the wonders happening. You got it Stacy and family. A Family that Prays together Stays together. The boys sure have grown. My family he has given me and then all my fur babies. They all have been my richest blessings!